Analysis of ice cores delivers continuous data for the first time on industrial soot from 1740 to today, reports HeritageDaily. In the first half of the 19th century, a series of large volcanic eruptions in the tropics led to a temporary global cooling of Earth’s climate. It was a natural process that caused Alpine glaciers to grow and subsequently recede again during the final phase of the so-called Little Ice Age. This has now been proven by PSI researchers, on the basis of ice cores. Up to now, it was hypothesised that industrial soot in the second half of the 19th century had triggered the rapid melting of glaciers occurring at that time. The first-ever analysis of the amount of soot (also called black carbon) locked in the ice and thus historically archived now contradicts this assumption. The resulting continuous timeseries of soot concentrations will, in addition, help researchers in the future to improve climate model simulations by enabling them to use experimental data. The results were published today in the scientific journal The Cryosphere. 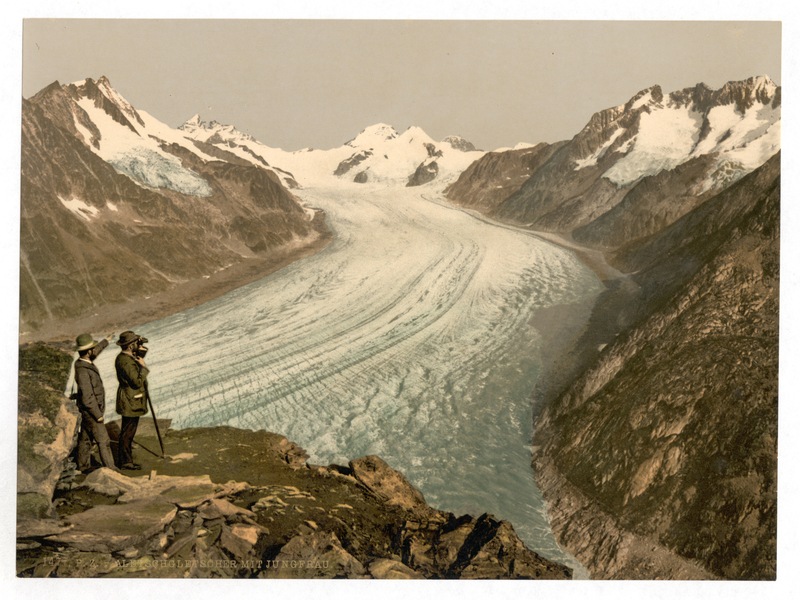 Images of Alpine glaciers from the 1850s compared to the present day are often used in order to visualise anthropogenic climate change. This is wrong, however, as researchers have now proven on the basis of data from ice cores. Scientists associated with Michael Sigl of PSI analysed atmospheric pollutants archived in the ice at different depths, with a focus on the amounts of industrial soot. Thus they created the first continuous data series for central Europe for the period from the 1740s to today on the amount of industrial soot in the atmosphere. These data clearly show that industrial soot can hardly be responsible for the melting of the Alpine glaciers at the time, taking place mainly between 1850 and 1875. “By 1875, the glacier retreat under way then was already around 80 percent complete”, Sigl says. But it was not until 1875 that the amount of industrial soot in central Europe exceeded the levels of black carbon naturally present in the atmosphere. If the LIA was caused by volcanic eruptions, then temperatures from then have to be adjusted upwards, right? Which begs the question: how much of the glacier retreat since then is also down to natural factors? It maybe that they can’t go too far off message and get anything published. SdP – a later para. heading says: ‘1850 is not suitable as a reference year for climate models’. Much of modern glacier retreat being wrongly attributed to human activity isn’t ‘saying nothing’ ? The LIA was a wee event at a trough of an Eddy cycle. Skip the three earlier ones, possibly being similar, but then the next earlier five were all major disasters. Definitions vary but the Little Ice Age lasted for a few centuries, more on than off. Norse settlers left Greenland in the 15th Century. @ oldbrew: Tks for the links. Agreed. This from the first link says it all: “Iceland was one of the hardest hit areas. Sea ice, which today is far to the north, came down around Iceland. In some years, it was difficult to bring a ship ashore anywhere along the coast. Grain became impossible to grow and even hay crops failed. Volcanic eruptions made life even harder. Iceland lost half of its population during the Little Ice Age.” It is major swings between two different conditions. This is precisely what one sees particularly in prehistory when whole established civilisations – at a much lower latitude – came to an enigmatic end. From my little delving, the swings are also presaged, or accompanied, by tectonic events particularly and including volcanic. The last three thousand years were milder than earlier in tectonic/seismic terms. The only difference I notice is a little drop in ‘temperature anomaly’ from proxies from both polar and equatorial regions, from what it was in the Holocene Max. At that time every peak and trough of the Eddy cycle was accompanied by an earth tilt change. Those changes stopped with a lower temp anomaly. The temp anomaly is now back at holocene level – or thereabouts-. If you can balance your checkbook you can trash the greenhouse effect. Would a tilt change like that be evident if viewed from Stonehenge? Tilt change was discerned decidedly first by GF Dodwell. Unraveling finally how Mnajdra megalithic calendar worked indicated clearly a tilt change in its alteration, proving Dodwell. (see https://melitamegalithic.wordpress.com/2018/03/26/mnajdra-south-calendar-design/ ). It is also indicated by several independent proxies, but those are subject to interpretation, based on what information one has. Not easy to perceive at Stonehenge. Example: Malta Tarxien temple is a late and utterly obfuscated useless design based on earlier ones, built on remains of older one with proper orientation; but not easy to realise that without the others to compare to, but with several bits of tenuous evidence as to what was its full potential. Mnajdra can predict solstice day and hour, as test proved). One thing is illogical to me on present thinking on Stonehenge. One cannot congregate at the site from long distances on the solstice day, without the ability to predict that day accurately. IMO it was one of the Stonehenge functions. Obliquity changes, accompanied by geological/seismic events – once realised and accepted – change drastically perceptions of the past and its climatic changes. I point to that evidence.